The incumbent Dutch minister of higher education, Jet Bussemaker, has urged institutions of higher education to pay more attention to the intercultural skills of students and lecturers, and to make sure the latter are well equipped to teach in English. 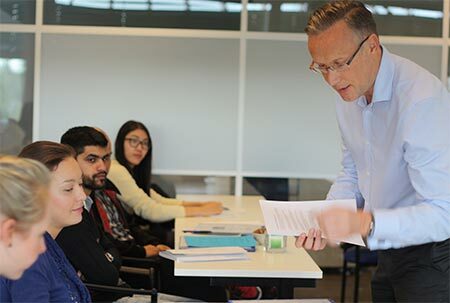 At Wittenborg University of Applied Sciences all Bachelor and Master programmes are taught entirely in English and its students and staff represent more than 80 different nationalities. Bussemaker was reacting to a recent study by the Royal Netherlands Academy of Arts and Sciences (KNAW), meant to give direction to the incoming cabinet on the country’s language policies in higher education pertaining to Dutch and English. With its high number of English-taught university programmes, the Netherlands is a popular destination for international students. However, within the country the ascendance of English has sparked much debate, prompting the government to order an explorative study to ascertain the value of giving instruction in Dutch and English. The study was presented by Bussemaker in parliament after she requested that the academy last year look into the effects of the increasing use of English in higher education on professional practice, on the progress of students into and within higher education, and on Dutch culture and society. The report points out that one of the advantages of instruction in English is that it allows foreign students to enter the Dutch education system, thereby promoting an international classroom. However, the committee highlights two crucial conditions for preserving or improving the quality of education. Firstly, institutions must do more than merely require lecturers and students to have a certain minimum command of the language and offer language courses. Secondly, to take full advantage of the enriching presence of foreign students and staff, both students and staff must master an adequate number of intercultural skills. In addition, lecturers must cultivate skills that allow them to provide effective instruction in a diverse and international environment. Bussemaker, in her letter to the Dutch Senate (Tweede Kamer) asked institutions of higher education to take note of KNAW’s recommendations, and said she will consult with the various education bodies. She supports the views in the report that more attention must be paid to the intercultural skills of students and lecturers, and that the latter must be well equipped for teaching in a foreign language like English. In reaction to the report, the Association for Universities of Applied Sciences (Vereniging Hogenscholen) said the use of English in Dutch higher education is a positive development if the aim is to give students an international perspective in an ever more globalised world.